Superheroes. Surely at some point they have wondered what it would be like to use their extraordinary powers for general day-to-day activities. After all, saving the world and fighting bad guys must get tiresome after a while! What about during a chance visit to one of our many UK paintball centres? Sure, some of the special abilities wouldn’t go down great with opponents who have to face them, even jealous teammates are going to get annoyed and we don’t even want to think how the marshals would take it – but it would still be seriously cool! Captain America, for example, would be carrying a pretty handy device for deflecting a barrage of paintballs, his very own high-spec riot shield. Players would never be safe from an aerial attack if Spiderman got involved, sniping from the trees and ensnaring players in webs to ensure a clean headshot! And why hide behind trucks for cover when you have the strength to pick it up and use it as portable defence? Superman would have little trouble doing so. Not forgetting Batman and Robin, those two would have an array of handy gadgets at their disposal, possibly modifying their semi-automatic markers into paint rocket launchers and setting up paint booby-traps when defending mission objectives. You might think this all comic book fantasy, but judging by this picture, players could be up against the forces of good far sooner than they think! 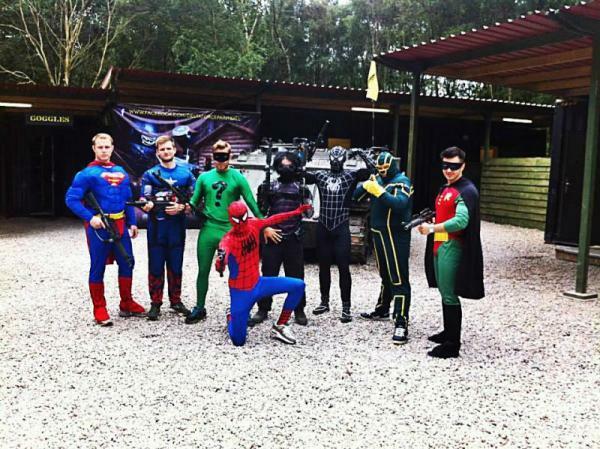 Which superheroes would you like to see in paintball gear? Let us know in the comments section below!